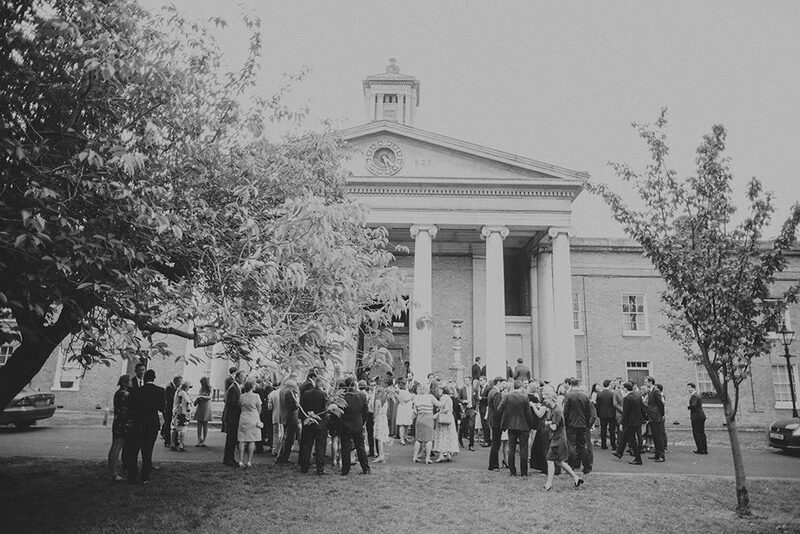 Hayley and Gus held their wedding at two of London’s most popular venues – Asylum Chapel and Snap Studios, both of which offer the most perfect blank canvas for a minimal, stylish wedding. (In this case, the talented Liz Linkleter, one of our favourite wedding planners has worked her magic). 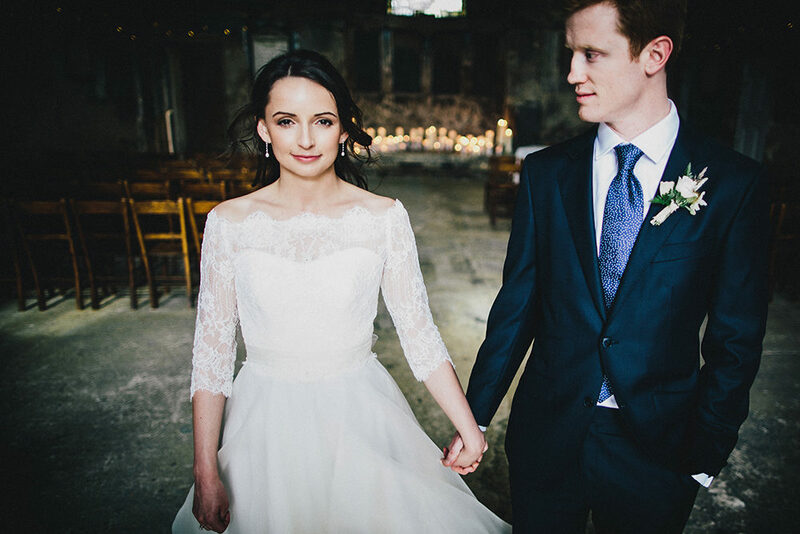 Hayley looks absolutely beautiful in Stephanie Allin, positively angelic in fact, as her and Gus are exiting the church – what an image captured by Marshal Gray. I loved reading Hayley’s report too, as she touches on the fact that it’s really difficult to find original ideas for your wedding day. With the world of Pinterest and wedding blogs it can feel like everything has been done before. We totally understand that, and always encourage people to fill their days with things that truly make them happy – rather than worrying about whether people have seen it before. Who really cares?! Your guests certainly won’t. 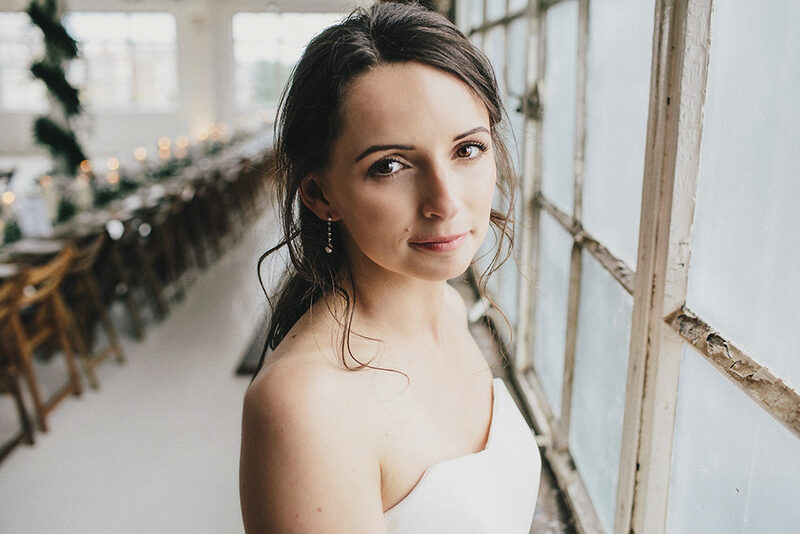 Hayley The Bride: We met on a rooftop bar in Singapore and whilst I wouldn’t exactly say it was love at first sight, it didn’t take me long to realise that he was the one. Fast forward a few years to a vineyard in Tuscany and a proposal at sunset. We didn’t have a theme as such, but the aim was to have a stylish urban wedding, with muted tones and a relaxed vibe. We have lived in East London for over 5 years and have really made it our home. 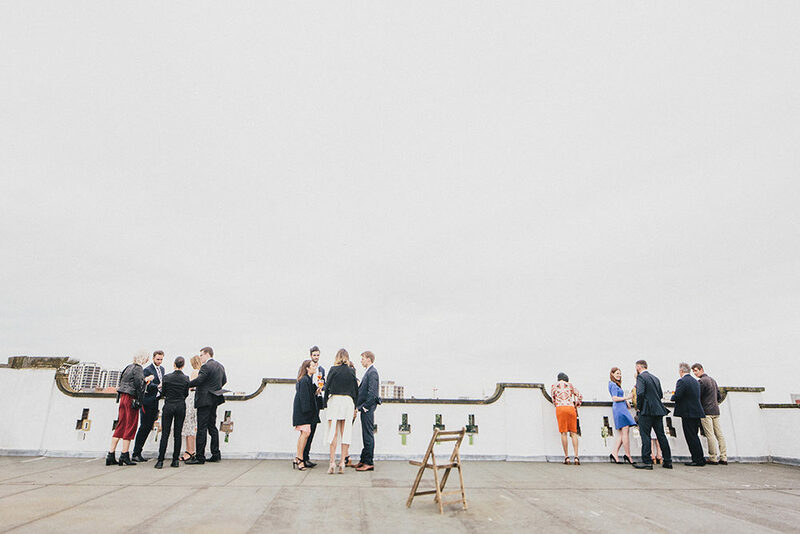 We wanted to have a wedding that to us showed off the very best of the city and reflected our personalities. We also wanted a wedding which felt modern and relaxed and was convenient for guests, a lot of whom were travelling from Australia, where Gus is from. Fortunately we were almost spoilt for choice in and around Shoreditch – there are some stunning industrial spaces but Snap Studios really stood out – by day it is a photographer’s studio and benefits from the most incredible natural light. It also has an awesome roof terrace where we had cocktails and canapes, a lot of exposed brick and the right amount of vintage props! Liz Linkleter did an excellent job of enhancing the space, complementing the urban feel with festoon lights and nearly 200 candles! India at Vervain finished off the look with the most stunning flowers and foliage table runners. 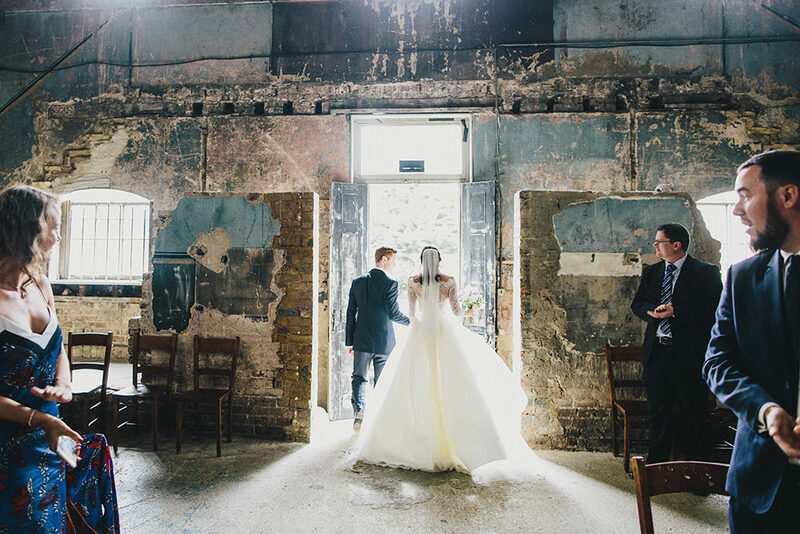 We got married in the very romantic Asylum in South London. 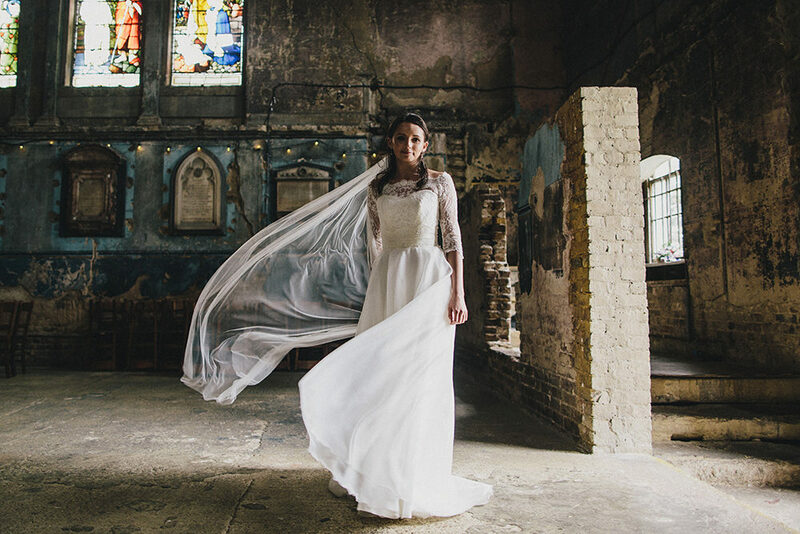 From the moment we first saw it, we knew that we wouldn’t find a venue more beautiful and atmospheric – the crumbling grandeur, candles and stain glass windows all make it a very unique place. Our guests arrived to our string quartet, Estilo, playing my favourite music from La Bohème and I walked down the aisle to Ombre Mai Fu. Waiting outside, I felt so nervous, but the doors opened and a wave of calm overcame me when I saw Gus standing at the other end. My father died a couple of years ago and it was very special having my younger brother walk me down the aisle. He took his job very seriously, didn’t let me trip and I was so pleased he was there by my side. Agnieszka from Southwark Council oversaw the proceedings and was fantastic – she was incredibly thoughtful and allowed us to make the ceremony our own. Gus and I wrote our vows together and saying them was one of my favourite moments of the day – promising to each other the things which we value the most in front of the people we value the most felt so special and really brought home the importance of the day. For our readings, we chose a passage from Great Expectations by Charles Dickens and a poem by Pablo Neruda. After the legal formalities and our first kiss, we walked down the aisle to Estilo’s rendition of the Beatles’ Hear Comes the Sun. After the ceremony our guests enjoyed Earl Grey & Rhubarb Collins and Elderflower Mojitos from the very cool guys at The Travelling Gin Company, before getting on Routemasters, champagne glasses in hand, and heading up to Shoreditch. When we started to plan our wedding, we were pretty overwhelmed by the very long list of items which had to be checked off – from the big items – choosing the venues, the dress, to the little ones, like the cake toppers. I unashamedly read every wedding blog out there for inspiration. As a result, I am not sure that there was one element which I thought was particularly unique or different; we took the favourite parts of the weddings we had read about to create our perfect day. We didn’t do any DIY really, but I did have ‘his’ and ‘hers’ cake toppers specially made – Gus is from Australia, so we had one of the Sydney Opera House and I was proudly represented by one of Big Ben. I absolutely loved the whole day and was so sad when it was all over! It is true what they say, the day really does fly by in a flash. Narrowing it down to a favourite part would be too difficult, but there are some standout moments for me. 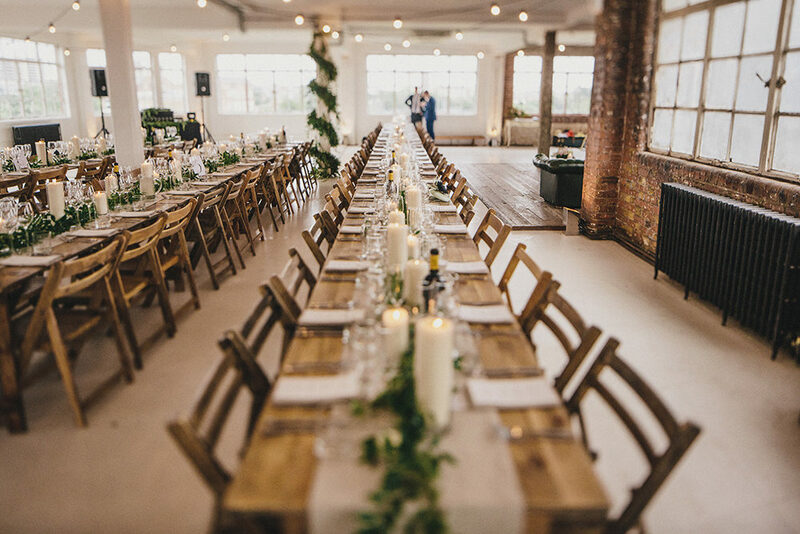 We arrived at Snap Studios slightly ahead of our guests and I loved having that moment to ourselves – the venue looked better than I had imagined and I just knew that we were going to have the best party! And we did, thanks in part to the excellent music played by the Wedding Smashers. By the end of the night, Gus and I spent most of our time being carried around on our friend’s shoulders and after the music was turned off, the remaining guests completed an excellent a capella rendition of Wonderwall to keep the party going. 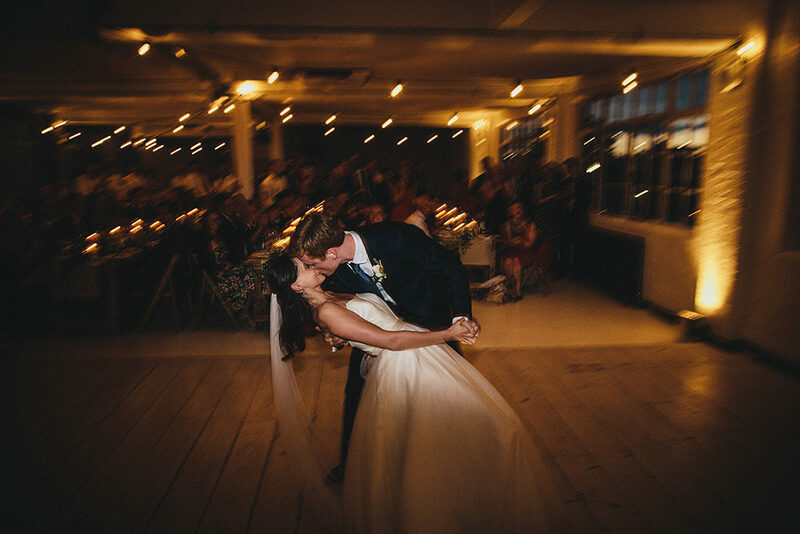 I also was surprised by how much I loved our first dance – we are both huge fans of Oasis and instantly knew that The Masterplan was the perfect song. Neither of us are particularly great dancers, but felt like rock stars as we shuffled around. 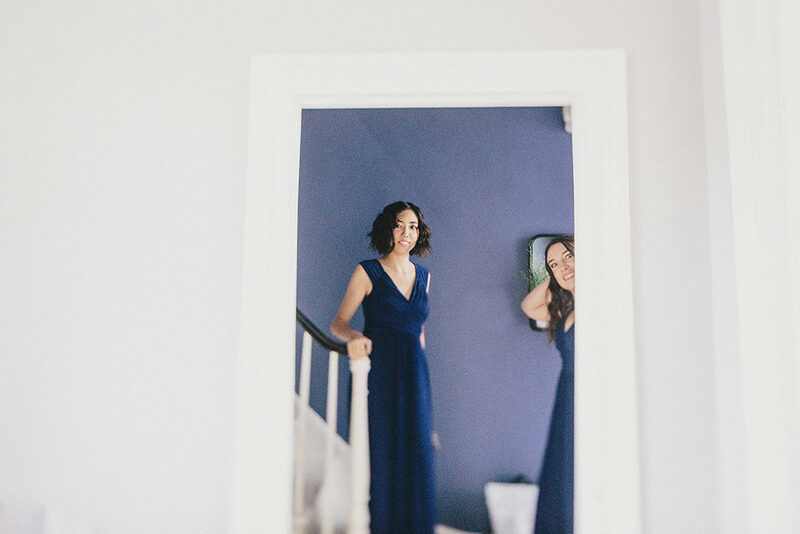 Finally, I loved getting ready at home – having my hair and make-up done is something I could get used to and once I put on my dress, I couldn’t have felt more bride-like! I loved enjoying that time with my bridesmaids and Mum and the feeling of nervous anticipation as I headed to the Asylum. Food is a big part of our lives and we really wanted to get it right for our wedding. Feeding 120 people is never going to be cheap, but we knew we were in safe hands when we found Ginger Jar and they delivered – the food was delicious. Snap Studios is dry hire and so we were able to save some money by carefully sourcing the wine and champagne. Other than that, it was more making little compromises along the way. I always used to look on with envy at photos of elaborate wedding cakes but our budget just wouldn’t stretch. I was so pleased though with the delicious cake baked by the Pretty Gorgeous Cake Company and actually loved the simplicity of it. I love planning – from holidays to weekends, I am the one holding the itinerary, so our wedding was a project I relished. 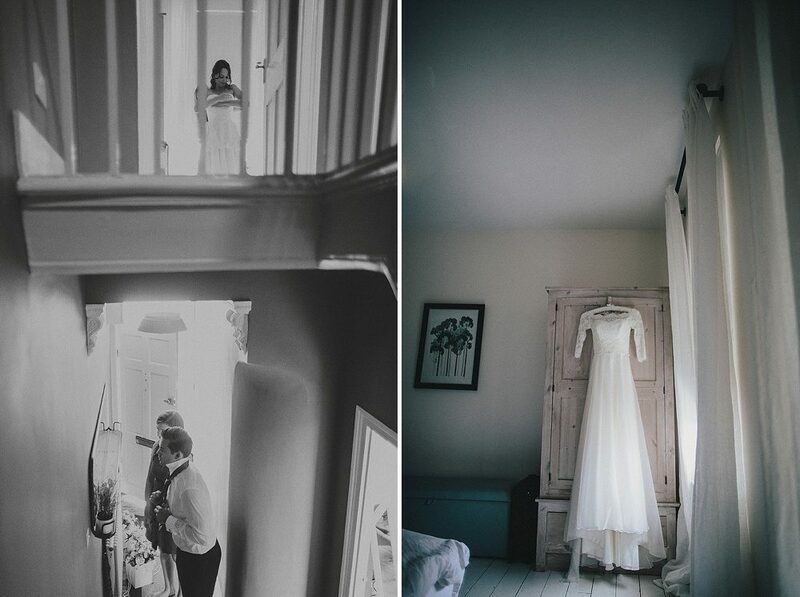 I loved thinking and planning every moment – from choosing readings which had meaning, to making sure the style and feel of the day was just right, to choosing a photographer that I knew would capture the day perfectly. I also loved putting my dress on for the first time, for every fitting and on the day. I absolutely loved my dress and the experience of choosing it and having it made for me – Stephanie Allin and her assist Mel were just fantastic. Compromise is never particularly fun and I didn’t love having to make decisions to fit our budget. With hindsight, I would have taken a few more moments to stop and appreciate what was happening. The day went by so quickly and I wish I had taken more time to take it all in. It is true what people says – on the day, the small stuff that goes wrong just doesn’t matter and chances are you won’t even notice it. It really is such a special day and you will love every minute of it. Download a wedding budget template form the internet, so you can keep track of costs! And be prepared for costs to add up, even if they seem reasonable (and even immaterial) on their own. Also, there is no such thing as being too organised – people book up early, so make sure you get in there first. Gin Bike The Travelling Gin Co. Wonderful photos, a great mix of black and white and colour, it’s lovely to see something different. Fab rustic setting and a beautiful couple! Very warm scene, really a romantic wedding. Hi, Would love to know where you hired your tables and chairs from? They look really pretty.